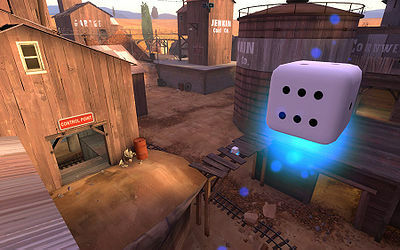 RTD stands for Roll the Dice and it is a mod that can be implemented in source games such as TF2. It allows the user to roll the dice and receive a bonus (such as instant kills) or a penalty (such as 1 HP). It is designed to make gameplay a bit more erratic and random, resulting in crazy chaos and hilarious events. If this is your first time playing TF2, then it is recommended to begin by playing on a regular server for a bit, so that you can understand game play a bit better before you play RTD. This way you can figure out mechanics, and strategy that don't revolve around relying on rolls. There are many regular players that are willing to help you out if you get stuck, or don't know what a roll does. However, if you have checked out each roll, you may gain better knowledge of what each roll does, and when it is best to use it. This wiki is being made by those helpful people who want to help others have a better understanding of RTD. This page was last modified on 6 October 2012, at 14:16. This page has been accessed 142,984 times.